Two-thirds of US chief financial officers (CFOs) say the best way to reduce the federal budget deficit is to cut spending, while 35% say that there should be roughly equal measures of reduced spending and increased taxes. That’s a key result from Chicago-based business consultancy Grant Thornton’s recent national, biennial survey. The random, online study was conducted about a month ago with 318 US CFOs and senior controllers participating. With regard to the national health care law (Obamacare), 49% said it will increase the pricing of their goods, 40% said it will decrease their company’s growth, and 37% said it will decrease their hiring. The three top areas of concern in terms of pricing pressure are employee benefits (75%), raw materials (47%—up from 27% back in October 2010) and energy (45%—up from 21% six months earlier). Among the changes to average costs per employee that companies are making, 30% are increasing salaries—up from 22% last fall, and 19% are upping bonuses—compared to 14% six months ago. Roughly eight out of 10 CFOs said they’re not making changes to things such as stock options, 401(k) matching, life insurance or disability benefits. Respondents were evenly split when it comes to support for a national VAT (valued-added tax) if it directly reduced personal-tax rates: 49% said yes; 51% said no. My Thoughts: That first bullet point is really loaded. Unfortunately, here’s even more evidence of future inflation and a “jobless” recovery just waiting to mess up the US economy. Half of the CFOs think they’ll have to raise product prices to cover their Obamacare costs? Four out of 10 foresee lower growth and less hiring? As more parts of the national health care law take effect this year and next, expect the impact to be felt across the board for manufacturers big and small. 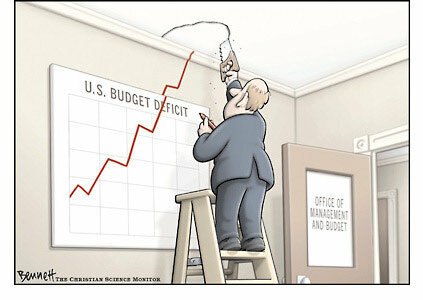 It also shouldn’t surprise anyone that those surveyed don’t support higher taxes to cure the federal budget deficit. Who wants to pay more to Uncle Sam? At the same time, I certainly support the third who reasonably believe more taxes AND less spending should go hand-in-hand. Where do you and your company stand on these issues? This entry was posted in flexible packaging, labels, package printing, paper/paperboard/cartons and tagged federal deficit, inflation, taxes, The Great Recession, unemployment. Bookmark the permalink. More taxes and less spending – what’s not to like?